This is one of the most surprising and awesome tales ever told in the history of medicine. These twins are Tatiana and Krista Hogan. Their brains and sensory systems are networked together, but they have separate personalities. Their story defies belief. So much, in fact, that Tatiana and Krista Hogan shouldn't be alive at all. Their chances of surviving the pregnancy, birth and first months of life were almost zero. Surprisingly, they turned four on October 25, and they are still healthy and happy, as you can see in the photo above. They play Nintendo Wii games against each other, they fight for toys and they share food and physiological functions. But they also share their senses. For example, one can pick an object out of her field of view, while the twin looks at the object. They share thoughts, too. Nobody will be saying anything, and Tati will just pipe up and say, ‘Stop that!' And she'll smack her sister. 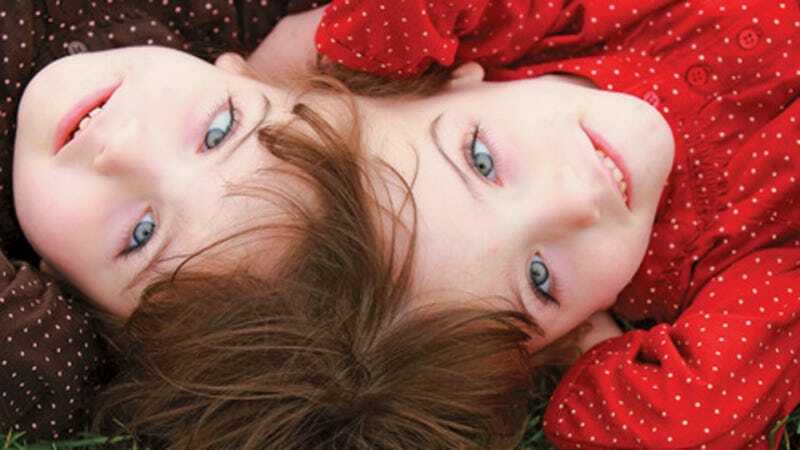 Their brains are recording signals from the other twin's visual field. One might be seeing what the other one is seeing. Nobody can possibly imagine how this may work and feel for them. And since they haven't developed their full verbal skills yet, scientists can't ask them about it. I don't know if they will have a lot of answers for them, however. If they ask me how I see or smell things, there is no way that I could accurately describe it. These actions just happen. Like you and me, they have no other point of reference. Their life is the only one they know. For them, sharing thoughts and senses is the only way things could be. But whatever the implications for science and philosophy are, their mother is just happy and grateful for every day with them. She also believes they're here for a reason but, "we just don't know the reason yet."